This is a very hilly park, and all of the trails are either going up or down for the entire length, some of it in the shadow of the Six Flags roller coasters! Because of this steep terrain, large parts of these trails, mainly the low-lying areas, are slow to dry. Waiting 2-3 days after a rain is a good rule of thumb, except in very dry or frozen conditions. The upper part of Dogwood going counter clockwise is almost always rideable, but the bottom will typically remain wet for a long period after rain since the whole area drains down through it. Please use your best judgment on deciding whether to ride them when they are wet. 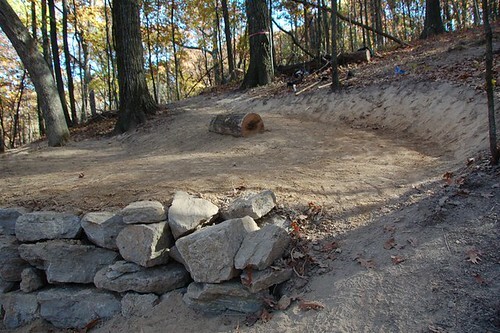 Many changes have taken place since GORC has reworked parts of existing trails, and built several new ones. The Dogwood loop was almost completely rerouted from 2004-06, and the DeClue trail has added considerable mileage, now stretching to 8 miles, and the current focus is in the northwest corner of the park on the Beulah Trail. Due to the number of trail features, and its rocky surface, DeClue (8 miles) is considered a fairly technical place to ride. 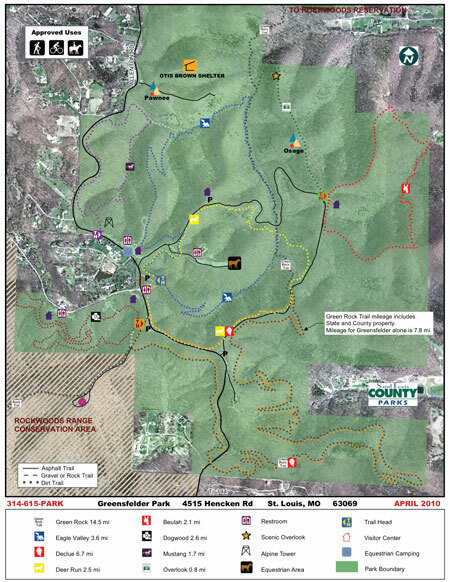 Expect a tough workout, and some sections that may require hike-a-bike (for short runs). If you like choosing your lines, fast narrow descents, and rocks to test your skills, then you'll love this trail. 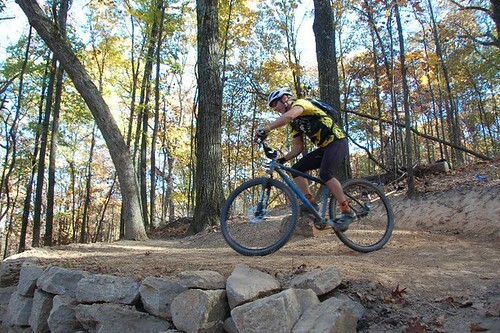 Dogwood (2.6 miles) is fast and flowy, with a banked s-turn, and some rocky spots thrown in to keep you on your toes. Eagle Valley (3.4 miles) is chat-covered doubletrack with the exception of 0.3 miles of singletrack behind the Visitor Center, and a short section near the stables. 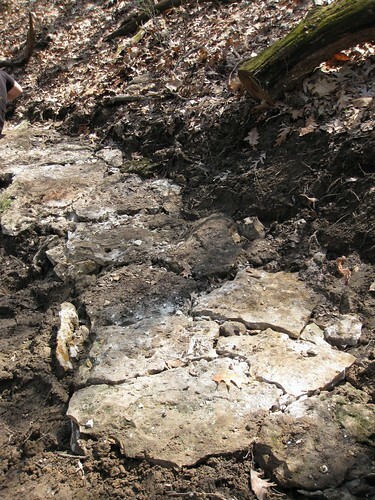 The Green Rock now shares a large part of its length with the DeClue trail. Its total length has increased to 14.5 miles, of which 8 are in Greensfelder. 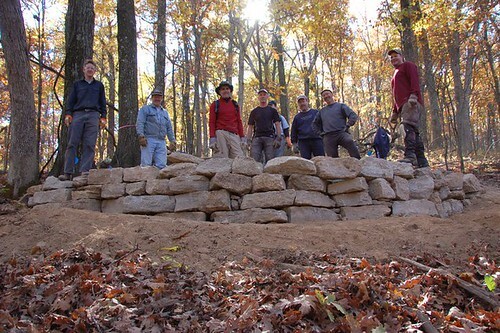 All of the trails in the park are open to hikers, bikers, and equestrians. Trail traffic often includes horses, so be careful and courteous when encountering equestrian traffic. Always dismount your bike and go off the downhill side of the trail. For the most part though, this park is not heavily used. Make sure and take the bug spray in the summer. If you want to "taste" Greensfelder before diving in, ride the Dogwood trail first. Depending on how you choose to ride the loops, you can get in rides from 8 to more than 18 miles just on Dogwood/DeClue/Eagle Valley. Take Interstate 44 to the Allenton/Six Flags Exit 261. Go north on Allenton Rd, past the Six Flags entrance. Allenton Rd. bisects Greensfelder Park. Parking is in the gravel parking lot for the Roundhouse Memorial on the left just before Hencken road. There is a pit toilet at the trailhead, and at the 2 picnic shelters. Water is available at the 2 shelters and the learning center. Walked DeClue this afternoon but bailed quickly, too soft to walk on. Walking the road towards the scenic overlook we saw lots of water on the visible trails, the s.o. road was soft too. Did Eagle Valley...mucky closer to the visitor center. I'd rate Dogwood as Yellow, with a tree down near the shelter entrance. Beulah, Fossil Ridge and Eagle Valley are all good. Overall fine, Couple sections have been leaf blown and holding moisture but the tread is firm. 2019 Race Loop is 100% leaf free. 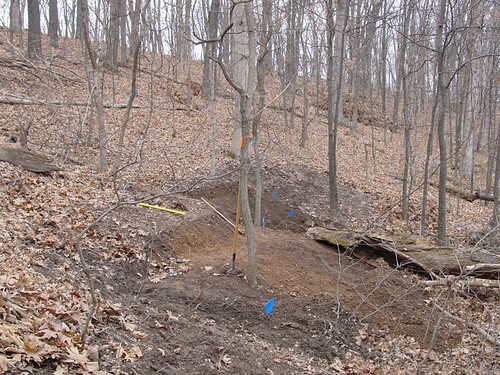 Couple mushy sections that were recently cleared of leaf debris build up, Overall firm and rideble. Walked most of Buelah and Fossil Ridge, Standing water on trail in spots. 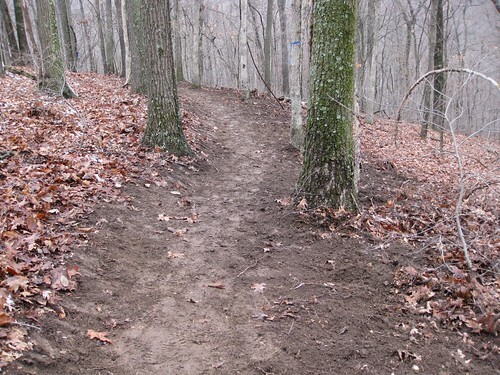 As firm as the trail is I would say with minimal rain today-tonight that tomorrow afternoon it will be rideable. The usual bogs will have to be avoided. excellent conditions, rain had no impact to the trail....lots of horse trailers in the lot.